This line follower was designed to climb over obstacles 1" to 1 1/2" tall. Each of the six motors is a 15 rpm 12 volt gearhead motor purchased from Jameco Inc. 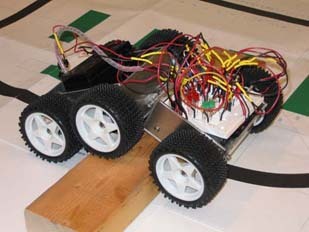 The circuit and voltage comparator, LM393, are the same that we used in our first robot, Sandwich.